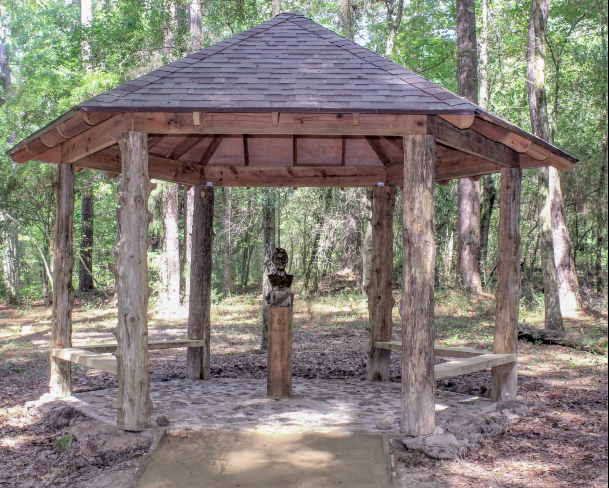 Guests can visit the Caroline Dormon Birthplace Gazebo while enjoying events at the Briarwood Spring Picnic. The gazebo was unveiled in October 2018. The beauty of spring will be celebrated at the Annual Briarwood Spring Picnic Saturday, April 6 from 10 a.m. – 4 p.m. at Briarwood Nature Preserve, Saline. Registration, along with tour information and coffee, will begin at 10 a.m. Participants can also register for door prize drawings. The log house museum will also be open for visiting. After 10 a.m., guests can go on guided walks and cart tours, departing from the education building. Native plants will be for sale, along with Caroline Dormon books, note cards and gift items. There will also be a silent auction, raffle items and door prizes. Music from the Back-Porch Band will be in the pavilion from 11:30 a.m. – 2 p.m. A lunch will be served in the interpretive center from 11:30 a.m. – 1:30 p.m. Among the door prizes/raffle is an overnight stay at the Writers Cabin and winners will be announced at 1 p.m. Tours will resume again at 1:30 p.m. The highlight of this year’s picnic will be artist reproduction of Indian drawings from the Caroline Dormon Collection at Cammie G. Henry Research Center. These drawings give emphasis to ethnologist Caroline Dormon and more insight into her study and preservation of local Indian culture and society. This year, the Foundation for the Preservation of the Caroline Dormon Nature Preserve will continue their efforts to provide educational opportunities to encourage the appreciation and knowledge of our natural heritage. Proposed projects include symposiums, art shows and publications. Briarwood Nature Preserve is located at 216 Caroline Dormon Road in Saline. For ticket information, call (318) 576-3379.